Without fanfare, Corsair has added a quartet of new 192GB hexa-channel DDR4 memory kits to its Vengeance LPX product roster. The capacious RAM kits are available in speed ratings from DDR4-2666 to DDR4-4000 and occupy a wide price bracket, from $1,585 (£1,455) to $3,000 (£2,750). 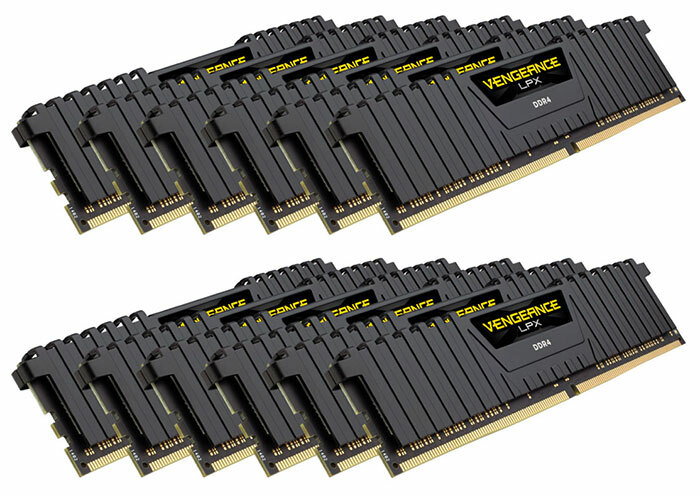 HEXUS has looked at Corsair Vengeance LPX DDR4 memory kits previously. The editor reviewed the Corsair Vengeance LPX 16GB DDR4-3200 way back in 2015. Corsair's Vengeance LPX RAM modules were lauded for their excellent build quality and flawless operation. Hopefully these qualities will translate to the newest high capacity kits, such as the 192GB ones we are discussing today. Corsair's new Vengeance LPX 192GB memory kits each consist of 12x 16GB memory modules to fully populate the likes of an Asus ROG Dominus Extreme board with an Intel Xeon W-3175X processor installed. The modules are designed for high performance, with their aluminium heatspreaders designed for fast heat dissipation. Corsair adds that each memory IC has been screened to determine its peak performance potential. Vengeance memory modules, and thus the kits, come with a limited lifetime warranty. The new 192GB kits are only available in black, no LED lighting is present here. For quick reference I have constructed a table outlining the Corsair Vengeance LPX 192GB memory kits now on offer at the Corsair web store. Of the above, only the DDR4 4000MHz C19 kit isn't available to purchase right now. HEXUS reported upon the launch of the Hexa-Channel Trident Z Royal DDR4 RGB kits from G.Skill, back at the end of January. Unfortunately, at the time of writing, these kits are still unlisted in within the G.Skill product pages, and we don't have any proper pricing, just guesstimates for these swish looking kits at this time. I think I'll wait for a bit. .all those GBS and its not EEC!! is there a problem with such high capacities without EEC support? In all honesty unless you're doing something where it's important to be 100% accurate (and even then there are limitations to ecc ram) then in most cases you can get away without eec. Something like 3D rendering can imo be done without ecc but something like working out the next vaccine to cure an illness would likely benefit from ecc. Yup, if you're running a specific heavily cache dependant network or productivity/development application, or filesystem like ZFS that operates assuming it's on ECC, then using ECC makes sense. Otherwise, not really. More dense modules are a bit more statistically likely to have bitflip events, but without the RAM being permanently packed with a huge cache of data, it's unlikely to impact anything significant.